Sri Lanka is urged to adopt a scrutinised strategy in engaging with China while utilising on balancing and enhancing measures such as FTAs to diversify relations with other economic powerhouses such as Japan and India to leverage on the island’s geostrategic positioning to establish itself as trade and finance hub, as similar to Switzerland in Europe. Drawing attention to China’s increasingly active role in the island nation’s economy, Kumar stressed that Sri Lanka needs to be fully aware of China’s interests. “The recent expansion of China’s economic and military reach has caught international interest – given China’s principle of active defence and history of self-interest. Sri Lanka should of course be fully conscious of this,” he stressed. However, Kumar acknowledged that large economies in Asia such as India and Japan are not in a position to fund Sri Lanka’s large infrastructure projects fully, and this has drawn Sri Lanka closer to China. “But often, this easy money which is offered comes with strings attached – unsustainable debt (as has been in the news lately), decreased transparency, restrictions on market economics and a loss of control over natural resources. Internationally, the Bridge and Road Initiative, into the designs of which Sri Lanka falls, has been viewed with suspicions by some that this global investment and lending programme leads to a debt trap for vulnerable countries around the world, fuelling corruption and autocratic behaviour in struggling countries,” he pointed out. Sri Lanka recently partnered with Chinese State-owned firms to jointly operate the Hambantota port and to setup a connected industrial park while the two countries have also partnered up to develop the Colombo Port City, which are seen as key developments in Sri Lanka’s ambition to become a regional trade and financial hub. “Access to an industrial park in Sri Lanka and management of the Hambantota Deep Sea Port and International Airport are seen as signs of China asserting itself at the international high table. These are also perceived as indications of Chinese designs to buy influence by creating logistics bases globally and alongside lock up access to strategic resources. “Port City Colombo, financed by China, promises to be a game-changer for Sri Lanka, and the government hopes its development would help Colombo to become an enhanced trading hub between Europe, Africa, the Middle East and Asia. “The port will also be a finance centre accessing the Indian subcontinent’s rapidly developing markets, hopefully attracting overseas investors and increasing employment,” Kumar said. While lauding the proposed Free Trade Agreements (FTAs) between Sri Lanka and regional powerhouses, he emphasised that these FTAs would be desirable as balancing and enhancing measures, particularly the proposed Economic and Technology Cooperative Agreement (ETCA) with India. “The Sri Lankan government’s turn towards broader engagement with East Asia recognizes the country’s pivotal position as a strategic asset to both India and China,” he said. Kumar reiterated that it’s essential for Sri Lanka to take a well-informed approach and to also engage with the rest of the economies in the region. He highlighted that if Sri Lanka was successful in bringing these economic powerhouses to work together, it possesses the potential of becoming the Switzerland of Asia. “Asia and the world will have a better future when the large economies work together, being sensitive to each other’s interests. What would it take for Sri Lanka to be that Switzerland of Asia where the major countries work together?” he asked. 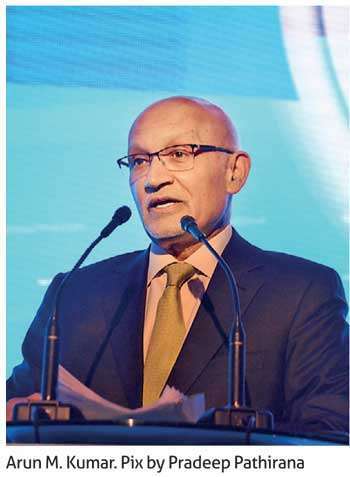 Kumar noted that global investors and trade delegations have identified Sri Lanka’s geographic location and access to regional markets as top reasons for their interest in the country’s economy. “The U.S. too is not far from considering Sri Lanka a strategic bulwark,” he said. He also spoke on factors such as export diversification, policy consistency, reforms of SOEs as well as reforms to ease the business environment and trade, which are vital to achieving Sri Lanka’s ambition of becoming a trade and finance hub. While noting that the government is moving in the right direction in terms of making the country more open to the world and becoming an attractive place to do business, Kumar advised the government to focus on execution as a sustained commitment which is required to see reforms through. Public sector reforms have to be the top priority of the next President of Sri Lanka, which requires a new Constitution, a top minister said. He asserted that a new Constitution not only requires to address the ethnic issue, but also resolve more crucial issues such as the unproductive public sector. The State Minister insisted that public sector reforms have to come from the top level of the government. “We need a new Constitution, because we need to claim that we have just 25 ministries and these ministries should be stated in the Constitution. No political leader in the country should be given any discretion to decide what the ministries of this country are,” he asserted. 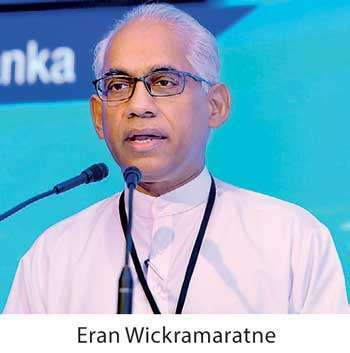 Wickramaratne also proposed to define the State agencies that fall under the ministries in the annexure.